Thank you for downloading our 100% ad free version of Proxy Rental! Thank you for joining the Proxy Rental team! Your download should begin within 5 seconds. If your download has not started, please click here. The setup is being downloaded. Find and Click the PRSetup.exe icon on the left bottom corner of the screen. 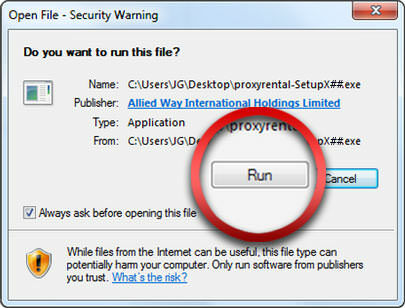 Click the «Run» button to start the installation of the Proxyrental application. 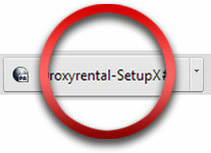 In order to install Proxy Rental, follow the directions as shown in our installation wizard. Restart your computer once the installation is complete. Double click the ProxyRental icon to start the application. 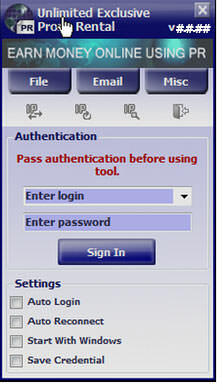 Enter your login name and password. Enjoy!